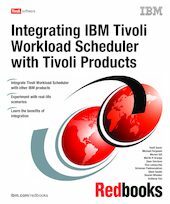 This IBM Redbooks publication explains the benefits and technical merits of integrating IBM Tivoli Workload Scheduler Distributed and IBM Tivoli Workload Scheduler for z/OS with other IBM products. Scheduling is a mission critical process for any company. However, when you talk about scheduling, you are really talking about an ecosystem. In this ecosystem, each solution is a building block that adds value to the overall solution. With IBM Tivoli Workload Scheduler, you can collect and add data to and from each component. In addition, expanding the scheduling ecosystem to include monitoring, management, help desk, storage, and business systems management provides greater value. This book discusses all these integration points and provides detailed scenarios on how to integrate IBM Tivoli Workload Scheduler with these types of applications. Because workload management is widely considered the nucleus of the data center, there are numerous opportunities for you to integrate IBM Tivoli Workload Scheduler with other products. This book addresses just some of these many opportunities. In terms of integration with IBM Tivoli Workload Scheduler, do not limit yourself to the products that this book discusses. Integration points discussed in this book should give you an idea of the potential value that IBM Tivoli Workload Scheduler integration can provide for your company.